Foam Tape- Campbell International Specialist Tapes. When you are looking for a single sided foam tape that has excellent resistance to ageing, weathering, oils, alkalis and certain acids then the Neoprene/EPDM (ethylene propylene diene monomer) blended Foam Tape is the perfect choice. This tape comes with a high grab adhesive on one side for bonding .. Designed specifically for use in the polythene tunnel industry this tape has a fixed clear polyester liner on the topside. This tape is now used in applications requiring general air and moisture sealing properties in many other industries. Sizes:	19mm x 3mm x 9m - Box of 15	25mm x 3mm x 9m - Box.. This is our high-density foam tape that is more suited to double glazed units, boat building, refrigeration systems and general building applications when looking for that perfect water, air and dust seal. Sizes:	12mm x 1.5mm x 50m - Box of 25	25mm x 1.5mm x 50m - Box of 12	12mm x 3mm x 25m - Bo..
An ideal foam tape to form a water, air and dust seal in applications requiring a light compression such as in light units, vehicle roofing and external cladding. Sizes:	12mm x 1.5mm x 50m - Box of 25	25mm x 1.5mm x 50m - Box of 12	12mm x 3mm x 25m - Box of 25	25mm x 3mm x 25m - Box of 12	12mm.. 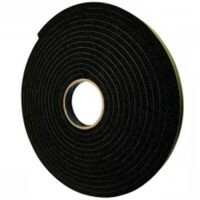 This closed cell PE Foam tape is the perfect foam tape to form an air and dust seal in applications where a high specification foam is required particularly for gaskets in the HVAC industry. Sizes:	12mm x 2mm x 40m - Box of 25	25mm x 2mm x 40m - Box of 12	12mm x 4mm x 20m - Box of 25	25mm x 4mm..